But now I've had a whole series of meetings with two people who want to get baptised. One is just in the beginning of the journey and the other one is about to 'cross the finish line' (I'm hoping to see this baptism and cry my eyes out before I leave Tartu:). And like I was told, I'm improvising, lol. And I've found out interesting things about myself and about Bible studies. Here are a few. I have no problem with talking for an entire hour without stopping to catch my breath. I'm really surprised to see I have so much to say. I'm glad both of them ask questions and express opinions, otherwise it'd be a monologue. I can get excited to the point of getting emotional when talking about God and His story. It's not really about head knowledge, it's about heart knowledge. Like I said to my senior pastor the other day when he asked how I felt about the whole thing now, 'God's not interested in brain surgery. He's into heart surgery.' Ezekiel 36:26 sums it up well. It's important for me not to burden people with many details. The lady who has just started studying the Bible came to the first class with a massive 200-pages copied material on theological issues and when I browsed it I realised it was one of those materials where you can spot two numbers on every third page: 2300 and 1260. I put that material down and told her we were not going to look at it any time soon. Now, 2300 and 1260 and 7x70 are truly fascinating and there's so much theological depth to them but I can't concentrate on roofing tiles when the building has no base. I hate cheap Christian cliches. I love observing someone's journey towards God. When you see this little faith seed getting stronger and bigger... Beautiful stuff. I would like to break another rule of mine and make a political comment today. It's about the on-going Gaza crisis. To kill systematically and cold-bloodedly members of one nation, no matter whether infants or elderly, men or women... Of all the nations in the world, I thought Jews would do better. That's all I've got to say. The lake concert in 2012. The scenery is truly beautiful. It was more than 15 years ago when a family from our local church initiated a tradition of worship concerts. 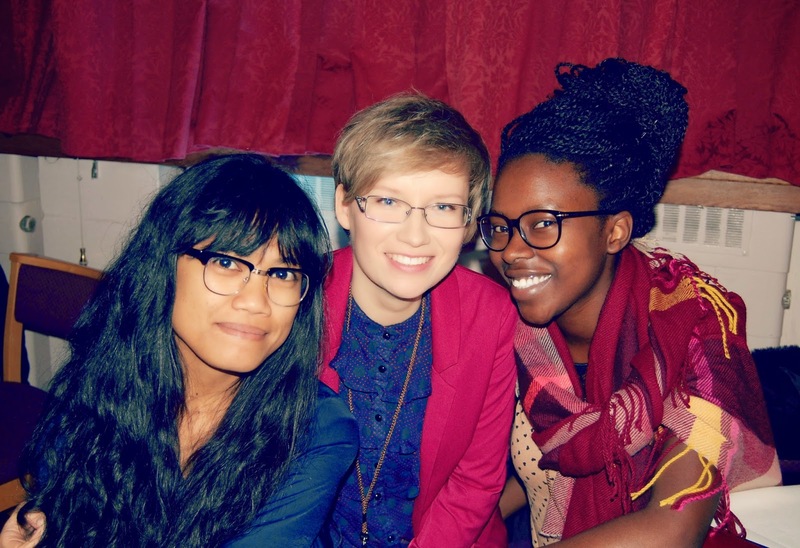 In the beginning it was just a simple invite for some friends to come over for a Sabbath afternoon and sing together. And then it started to grow. They started to invite other friends over to listen to this singing. And as they are a very influential family in that place where they live, more and more people started to come. 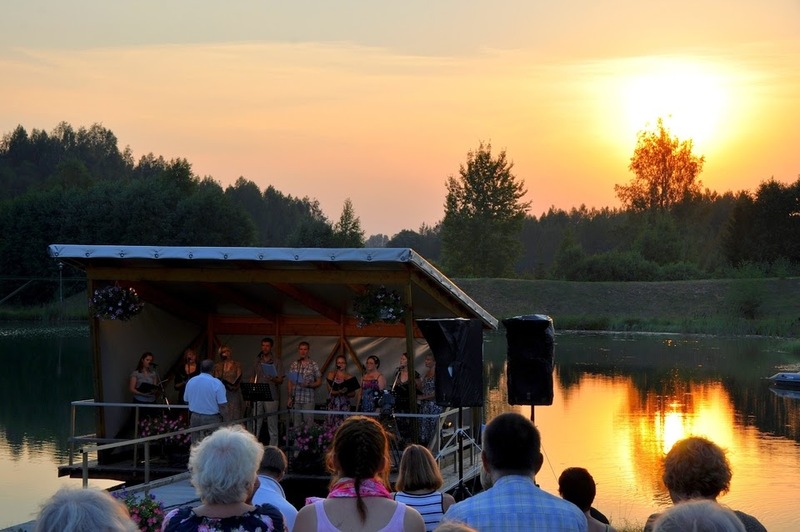 Now it has ended up being a full-scale concert + preaching on a platform on their own private lake with sometimes up to 200 people in the audience listening. I've never missed one 'lake concert' (as we call it), it is an essential part of my summer as our family has always been involved in it. For many years I've been singing and playing my violin there. As a teenager I admired the preachers who spoke to mostly non-Christian audience. I've heard my dad preach there for couple of times. Last year I was the invited speaker and I got to share the Gospel news with those people. We had yet another lake concert yesterday evening. It brought back all the sweet and painful memories from the past. Last year's concert took place in the beginning of August and it must have been one of the toughest weekends in my life. I have very fragmented memories from that weekend. On Friday morning we found out that my mum had cancer, I remember sitting on my parents bedroom floor, absolutely gobsmacked by the terrible news. I remember being on a bus later that evening, trying not to cry too much. I remember preaching on Sabbath morning, not having slept and not having eaten, begging for God's strength to take me through the sermon. And I remember arriving on the lake concert site on Sunday afternoon, once again having to preach the Gospel to others, with my own heart being completely broken. And I remember going home that night and rushing to hospital the next morning to tell my mum how wonderfully everything had gone despite our own tragedy. I couldn't get rid of all those pictures in my head last night. And I know that the time is over when my grief was socially acceptable and I can't go around crying my eyes out publicly so I kept my thoughts to myself, but it wasn't an easy evening. But something happened there that really calmed my mind and soothed my pain. In the end of the concert we sang a song with a women's chorus about the day when Jesus comes back and restores everything and wipes away all the tears we've cried. And you wouldn't believe, the sheet of music with this song had been copied by my mum. IT WAS HER HANDWRITING. So I sang about Jesus' return and our blessed hope, reading the words and music my mum had written down. Maybe it was just a coincident, I don't know. But for me it was a reminder of her, waiting for the restoration of all things too. It was almost as if Jesus had sent a little text message to me. "Don't worry, she's safe. You'll all make it Home alright." Here's a quote by Frederick Buechner. He's talking about Mary Magdalene and the resurrection of Jesus. I find it terribly beautiful. So beautiful that I need to share this with you. "Noli me tangere," he said. "Touch me not. Don't hold on to me" (John 20:17), thus making her not only the first person in the world to have her heart stop beating for a second to find him alive again when she'd thought he was dead as a doornail, but the first person also to have her heart break a little to realize that he couldn't be touched anymore, wasn't there anymore as a hand to hold on to when the going got tough, a shoulder to weep on, because the life in him was no longer a life she could know by touching it, with her here and him there, but a life she could know only by living it: with her here—old tart and retread, old broken-heart and last, best friend—and with him here too, alive inside her life, to raise her up also out of the wreckage of all that was wrecked in her and dead. 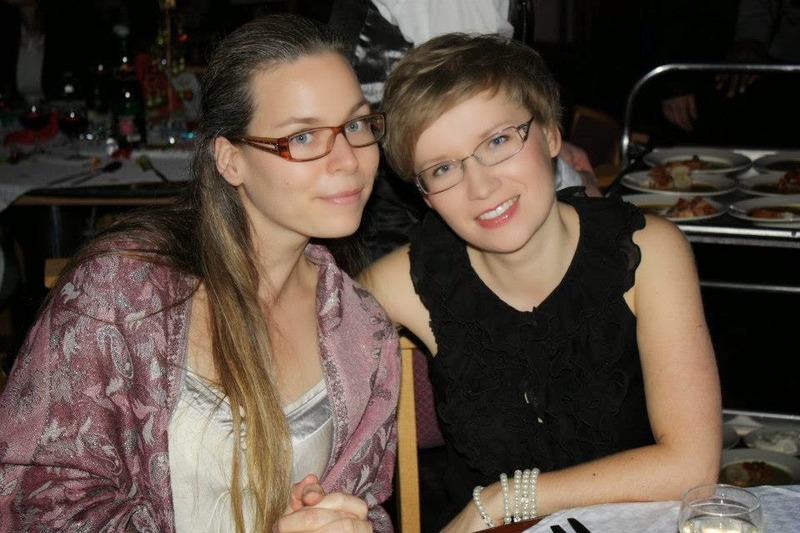 With A. at one of them Christmas banquets. I'm still convinced she was the best roommate one could ask for. Oh, don't we look just great! :P With MJ and D. at The One Project last November. The Experience and JUMP people on the river boat. With U. I really like that water behind us. And yes, I had pink hair back then lol. At Daruchini's. It must have been MJ's birthday. 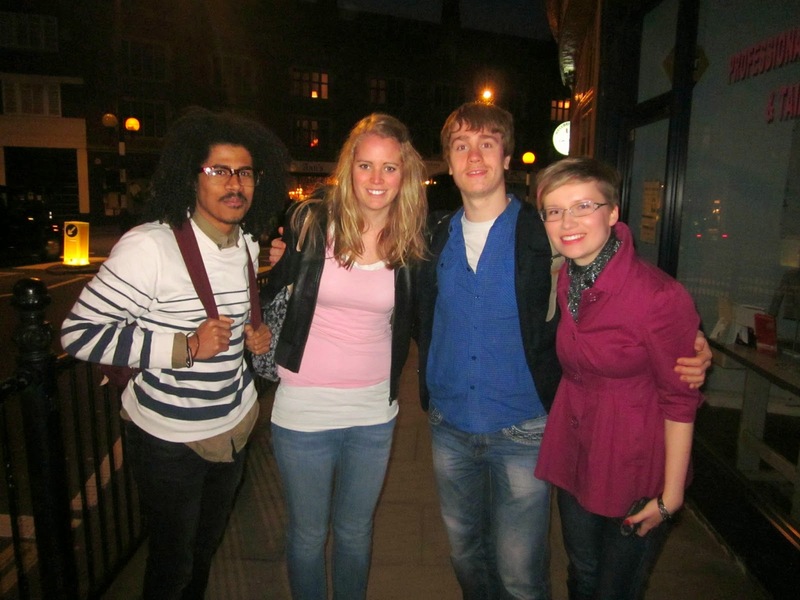 Hanging out in London. I can't remember the occasion though. 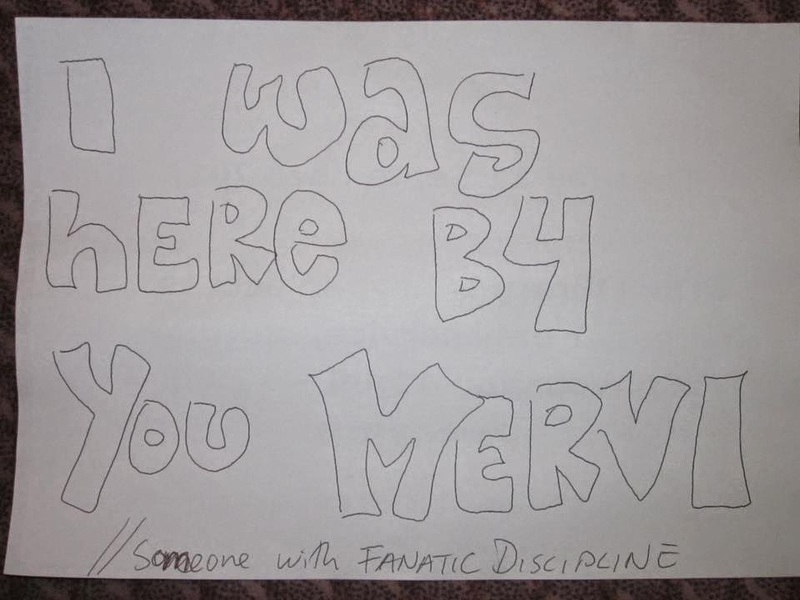 I found this on my library desk once, haha! I have a Bible study later today so I'm sitting in my office, getting ready for it. I know my awesome intern pastors friends give Bible studies every second day and it's no big deal for them but it's kind of a new thing for me. It requires quite a lot of work but it's also fun, I enjoy doing it. Like today, I get to talk about Jesus for an entire hour. It can't get much better than this. As to music, it's quiet time these days. I listen to classical music and not much else. Here's what I'm listening to right now - French composer Erik Satie's beautiful piece Gymnopedie No 1. This piece makes me sad and happy at the same time. Saturday night at the camp site. At times, Estonia can be breathtakingly beautiful. I just got back from the youth camp. I've been out in the bush with my youth for the last four days. I will really appreciate sleeping in my own bed tonight, let's just say that. I really thought I could come home after my mum's funeral and continue working as if nothing major had happened. Well, wrong answer. I had a terrible week last week. And what made it even worse was the fact that I couldn't possibly escape from all my obligations, I couldn't just shut off from the world and hide, I still had a baptism class and I still had my sermons and I still had all the people to meet. To be honest, I wasn't exactly thrilled about traveling down to Southern Estonia and hanging out with all the teenagers I knew would show up. But it was alright. Teens are cool, and they were actually really nice days. I like watching them grow up and I still hope I might be able to play a little part in showing them the beauty of the choice of following God. On Friday morning I skipped the camp activities and spent some time in the nearby town to get ready for my evening sermon. And I sat in someone's living room with the Bible and sermon manuscript on my lap but all I could do was to watch BBC news with my eyes wide open. There were two major news on BBC that day - Israeli air-raid in Gaza and the plane crash in Ukraine. It was hard to believe what I saw on the tv screen. It actually gave me some sort of apocalyptic feeling while getting ready for my sermon. So I went back to the camp meeting in the evening and preached on "For me, to live is Christ" text and I couldn't help pouring my heart into it. I just wish so bad so bad that these young people would get their lives centred around Christ in this mad and sick world where any of us could be dead in a blink of an eye. When the camp ended this afternoon the organisers gave me something to remember this camp by - I got a trophy for preaching with "Youth Camp 2014" engraved on it. 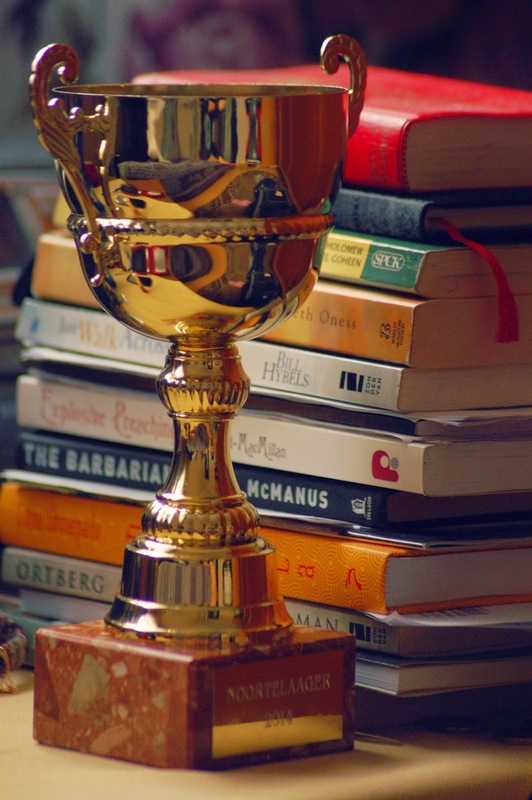 It sits on my shelf now and when I look at it I get this funny feeling that this trophy is actually for the whole of last week. Because it's not only that I made it through this week. I quite literally came from my mum's funeral and told my youth that for me, to live was Christ. I like commuting between Tartu and Tallinn because they've put some luxury buses on the road. Leather seats and private tv screens and wifi and all. So when I need to take a bus to Tallinn and I don't necessarily have to study or read, I usually switch off my brain and watch a movie. And so it was that two weeks ago when I had to go and attend a church board meeting in Tallinn, I watched a movie on the bus - Mr Morgan's Last Love. A beautiful movie and a good story (with only one cliche too many), love and life and death and all those topics... And Sir Michael Caine, ah, the guy could be a hundred years old and he's still a heart-throb! Anyway, the movie ended with Norah Jones' song Not Too Late. I've been listening to it a few times since the movie. So it's also today's tune. So we had a little family funeral yesterday and laid my mum's ashes to rest. I don't really want to say much about this day, there are many things that are better left unsaid. But still a few things. I found it really heartwarming how my mum's eldest brother conducted the short ceremony at his place (which used to be my grandparents house and their childhood home). He looked back on the day he was a little boy and was sitting on the stairs of their home and was waiting for his parents to come home from the hospital with his little newborn sister. He was the first one to greet my mum when she arrived home. And now he was the last one to send her to her resting place, so it was him - not my dad nor us, children - who took my mum's ashes and carried them out of the house. I found it terribly beautiful. I still tear up when I think of it. I'm trying to convince Jesus to come back. Like, now. 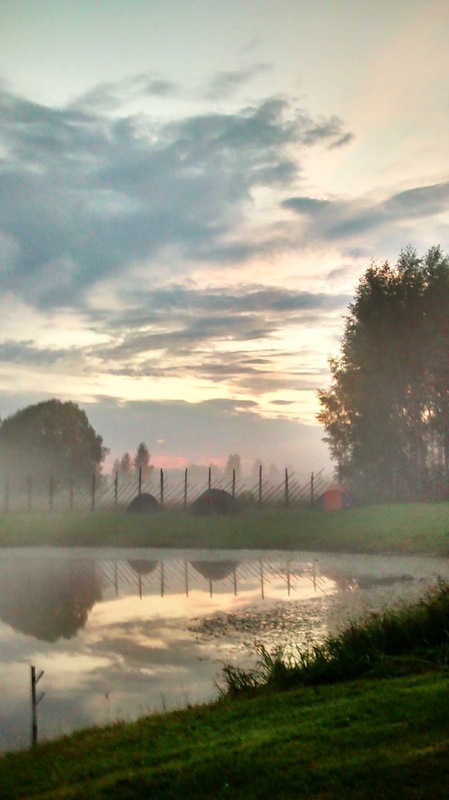 It was sometime last week when the reality of leaving Tartu started to dawn on me. First time it happened on Friday evening when we had our last small group gathering at my senior pastor's house. They're moving to Tallinn too and as they have much more stuff and also a vacation coming in August, the house already looked like a warzone. We had to eat from cardboard plates and sit on the carpet (because plates and sofas had been packed up). That's when it hit me. 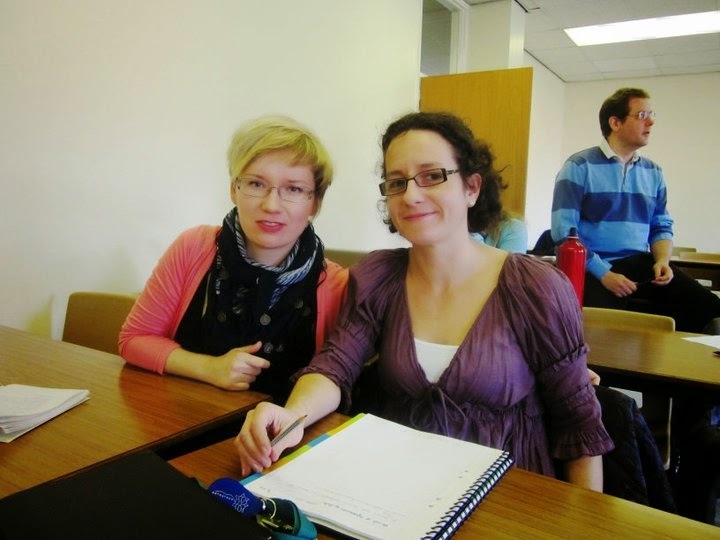 And so every now and then I get those stings of melancholy when I remember that my time in Tartu is almost over. Last Saturday a lady from my church told me she was sad about my leaving. Yeah, tell me about it! Yesterday morning I waved goodbye to my pastor's family as they packed their last stuff and moved out. And yesterday evening just before football started I went out for a jog and I was like, it's only now that I start enjoying jogging here around this lake, and I only get to do this until the end of August. Today, after I'm done with my sermon prep and youth Sabbath school prep and my office work, I'll pop by my favourite second hand bookshop that's pretty much across the street from my church. Maybe my favourite cafe later in the evening. Oh man! I like this place! We'll have a small family funeral this coming Sunday as we bury my mum's ashes near her childhood home. And thus I've found myself facing the age-old human problem everyone has to deal with at some point - the things I wish were permanent turn out to be temporary, and the things I wish were temporary or didn't exist at all are here to stay... Such is life. Alright, the Song Festival for the last time and then I won't mention it again for the next five years. Here's the last song of the Song Festival, titled "Ta lendab mesipuu poole" ("He flies towards the beehive"). It's just about as patriotic as a song can get. It compares people to bees who have an urge to fly towards their beehive. "Even when the winds of death blow and the bullets of death fly, you forget about dying and suffering, and rush towards your homeland" says one line. One has a very sacred feeling when singing this song at every Song Festival. This particular video shows the song being sung for the second time. In the beginning of it you can hear the singers chanting "Mesipuu, mesipuu" (beehive, beehive) so the conductor Ants Soots comes back for the second time and they sing it again. People with those oak wreaths are the conductors. It's a strange feeling, everyone knows the festival is over and yet no-one wants to move or leave. In the end you can also see the waves that start with singers and go all the way through the audience. I think this is the best moment of all - when there are no performers and no onlookers left, just Estonians. So the Song Festival took place yesterday. I'm back home now with a serious sunburn and beautiful memories. It's hard to put the emotions into words, quite impossible actually. So I won't try. But I post some photos (not mine) here which may help you understand the size of this event. 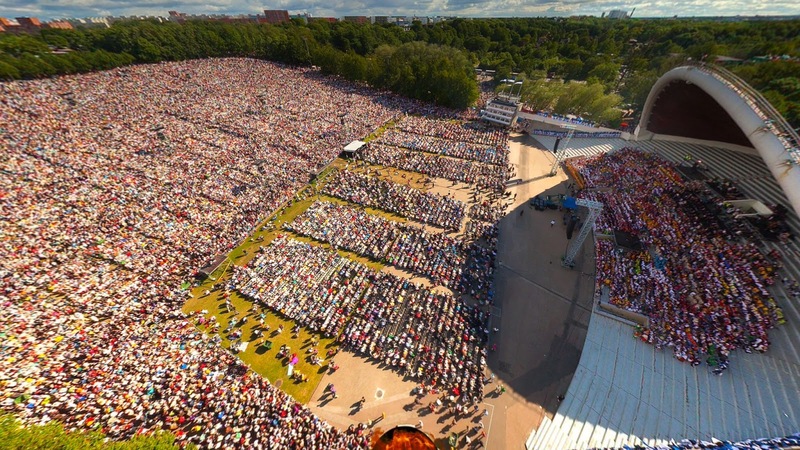 They say it was the biggest one so far, with about 29 000 singers (22 000 adults and 7000 children) and approximately 70 000 spectators. The biggest choir in the world. Madness. Song Festival Grounds. Children singing. My brother and sister-in-law somewhere there. With J. and H. Trying to hide my jealousy. :P One day I'll make it on stage too! This coming weekend the whole of Estonia will go absolutely crazy. We'll have the Dance Festival on Saturday and our big Song Festival on Sunday. 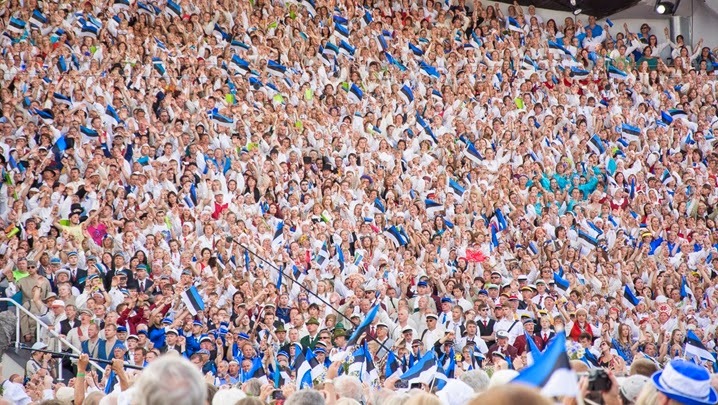 It is almost impossible to express the significance of singing and it is definitely impossible to overemphasise its importance for Estonians. The Song Festival tradition started about 150 years ago and it has always been the main carrier of our national identity. Especially during the occupation years when coming together after every 5 years reminded the nation that the hope of freedom and independence was never quite dead. These were the times when any public reference to national independence was forbidden and so it was that singing - even under the red Soviet flag - became the symbol of non-violent resistance. 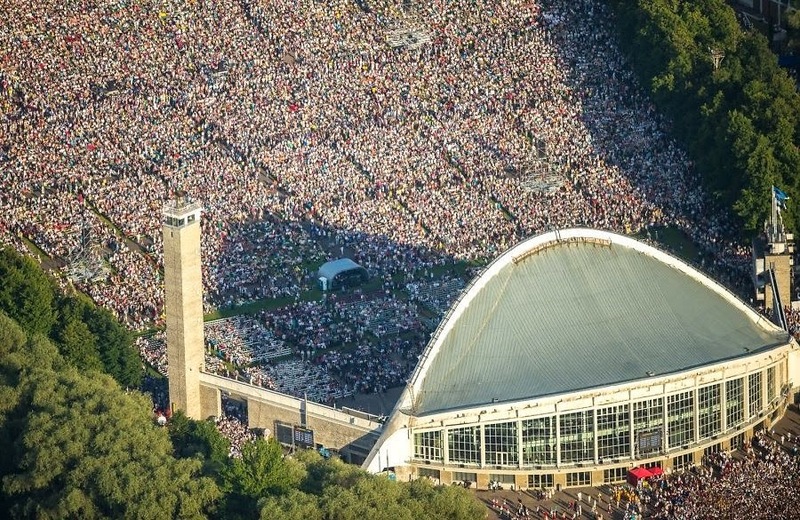 In September 1988 there was a mass gathering with about 300 000 Estonians singing in Tallinn's Song Festival stadium. And it's almost impossible to believe but that's how we gained our independence. By singing. Not one gun was shot. Not one man died. 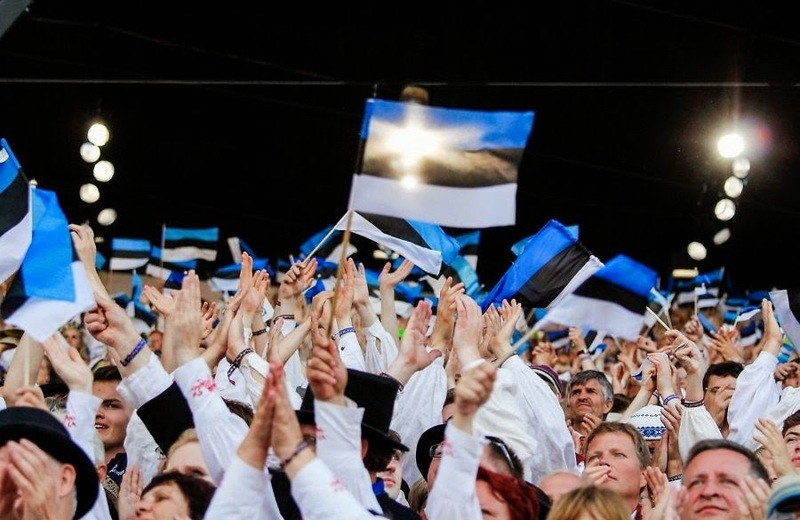 The invincible Soviet empire collapsed and Estonians sang their way to freedom. Sociologists nowadays describe the Song Festival tradition in religious terms. And it's accurate. 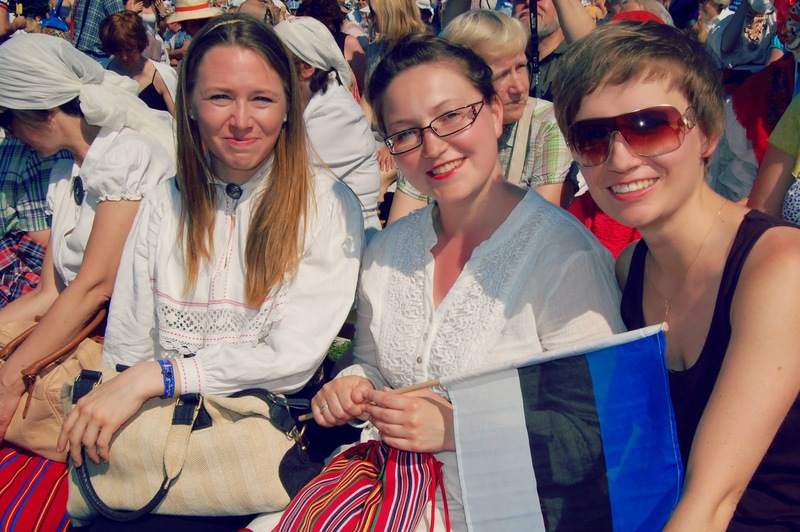 Estonians who make the second most atheistic nation in Europe still have one thing and one place they regard as holy. The Song Festival is their worship service and the Song Festival stadium their sanctuary. And the experience - I can bear witness - is very religious. It is indescribable to have a choir of 20 000 singers and the audience of about 80 000 people singing together, breathing together and crying together. By the end of the festival you can't tell where the choir ends and the audience starts because everyone is standing and singing their heart out all the same. Including me. My older brother and my sister-in-law made it to the Song Festival this year. Their choir made it, that is (the competition is tough). So I'll go and wave the flag and sit and sing and watch them sing on Sunday. Beautiful stuff. Here's a trailer of a documentary called Singing Revolution some Americans made a while aback. It's a terrific overview of our history and the song Festival tradition and of 1988 happenings. I strongly recommend it. :) I get goosebumps every time I watch it. "My life is too fashioned and guided by the same hands that beckoned the stars and the flowers at the world's dawning and make the day and the night... If a thousand years in his sight are but as yesterday, then in his eyes even my little cares will weigh no less than the immensities of Sirius; then for him the tiny stretches of my daily journey, for which I ask his blessing, are just as important as the light years that measure the reaches of cosmic space." Today's song is Joel Ansett's Waterfall. Thanks for the song recommendation, N.!